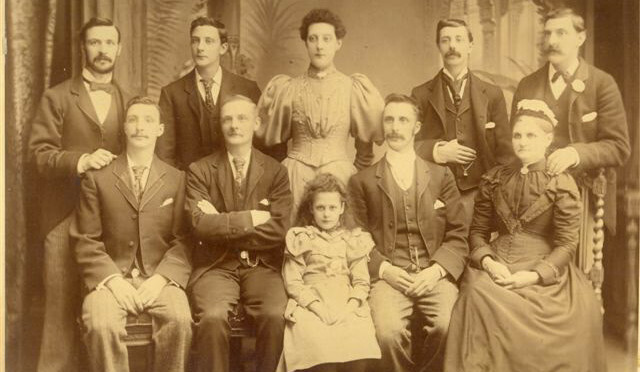 Tearle Family history in Preston, Lancashire. The Preston Tearles are all descended from one marriage in Leighton Buzzard, Bedfordshire, between Joseph Tearle 1803 and Mary Ann nee Smith. They had (amongst many children) a son called Joseph, born in 1838, who married Sophia Kibble in Preston, Lancs, in 1858. Other members of the family drifted up to Preston on the Euston-Dunstable-Preston railway line and became part of the Lancashire business culture that Joseph had joined. Unsurprisingly, the parents of Joseph 1803 were Richard 1778 and Mary nee Pestel, and Richard’s parents were Joseph 1737 of Stanbridge, and Phoebe nee Capp. Joseph Tearle 4029 WW1 army medal rolls. Firstly, on 31 June 1915 he joined the 4th Battalion, Loyal North Lancashire Regiment and was given the number 4029 and the rank of private. 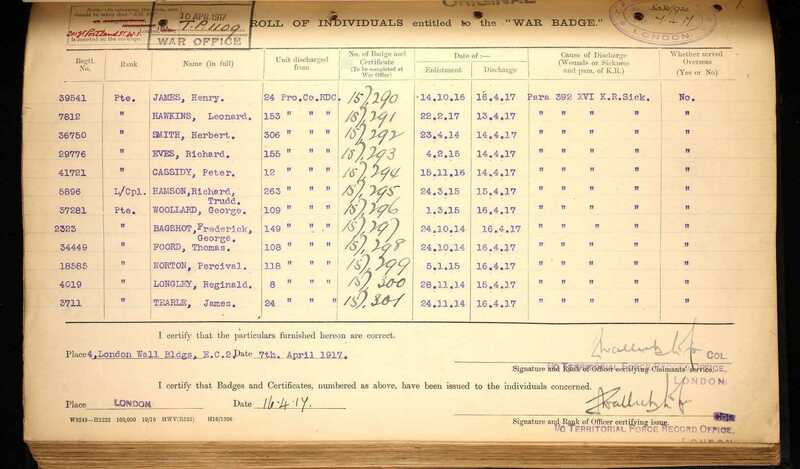 His discharge date is odd – in the middle of 1916, fully two years before the armistice of 11 Nov 1918. In the next column is the reason for his early release – he was given a Para 392 discharge. Paragraph 392 of the King’s Regulations refers to a medical or physical condition (eg wounds) so serious that he “is not fit enough to be an efficient soldier.” I cannot find the Chelsea records that would document the process of this decision, but I do have the document that grants him the Silver War Badge. 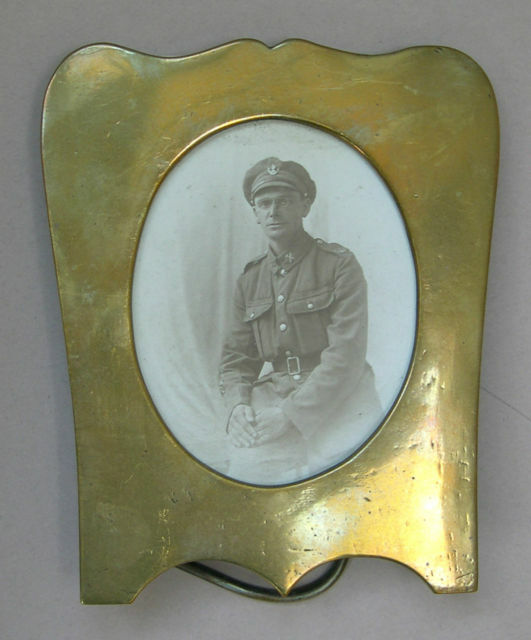 This badge would allow him to go home and wear it on his civilian clothes to indicate that he did everything he could to go to war, that he had caught a dreadful sickness caused by active service, and to the highest standards of the British army, he was in no condition to fight. Discharge Unit: 4th L.N. Lancs. Joseph Tearle 4023, WW1 Silver War Badge. The hand-written numbers in the central column are the serial numbers of the badges awarded to each soldier. You can see that he was given a Para 392 discharge, and that he had not fought overseas. Additional information: Husband of Alice Maria Tearle. Grave/Memorial Reference: A2. 12. 16. I had wondered for a very long time who this was, but Lost Generation told me he was James and I had a James 1862 of Preston married to an Alice M… Was the CWGC wrong about his age? Ancestry gave me the medical records for a soldier whose military service began in 1880 and this lead me to be increasingly certain we had this chap already on the Tree. His parents were Thomas 1836 of Leighton Buzzard and Emma nee Ayres who moved up to Preston around the time Thomas’ brother Joseph 1838 of Leighton Buzzard (LB) did, closely followed by their father, Joseph 1803 Tebworth. Young James had brothers George 1868 Preston, and Robert 1871 Preston, both of whom died in 1873. Their father Thomas died in 1871, close to the birth of his youngest son, and their mother Emma died in 1879. In the space of eight years, James had become an orphan, with no family at all that he knew about. At 18yrs he joined the Loyal North Lancashire Regt, renewing several times. I can’t find any record of his serving anywhere overseas except for one year and 196 days on Gibraltar, in 1884. At this time he gave his next of kin as Sarah and Robert Gaunt of Preston. I have looked for a Sarah Tearle in Preston, but I can’t find one, so it is likely they were his foster parents. Around 1891 (I can’t find the marriage certificate) James married Alice Maria Edwards of Sipton, Staffs. In the 1891 census of Burnley, Lancs, they were newly married and living in 28 Aqueduct St, James describing himself as a Herbalist’s Assistant. Between 1892 and 1899 they registered four children in Colne, Lancs; Emmeline 1892, Alice 1894, Reginald 1896 and Minnie Louisa 1898. In the 1901 Colne census we can see James, Alice and their children living in 70 Market St, which is also the business address. James is a Herbalist (Shopkeeper) and the census enumerator categorises him as a SubMed. James 1862 Preston 3711 and 2763 and 20724 ex-Lancs attestation 1914 in Wales. 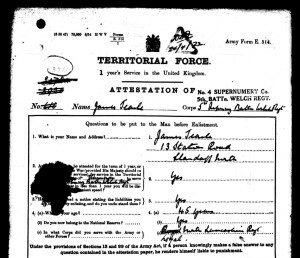 WW1 started in June 1914 and James signed his attestation form, for 1 years service, in Cardiff on 16 Nov 1914. He said he was aged 45, but you can see that CWGC has this transfer at age 36. He transferred from the Loyal North Lancashire Regt to No 4 Supernumerary Co, 5th Battn Welch Regt, presumably because he was still a reservist, but now living in Cardiff. I have attached the two documents crucial to establishing who he was and to show his original attestation to the army in 1880 and again in Cardiff in 1914. You can see his Loyal North Lancashire number (20724) in the lower document. It’s difficult to read because it’s scribbled out, but subsequent documents clarify it. 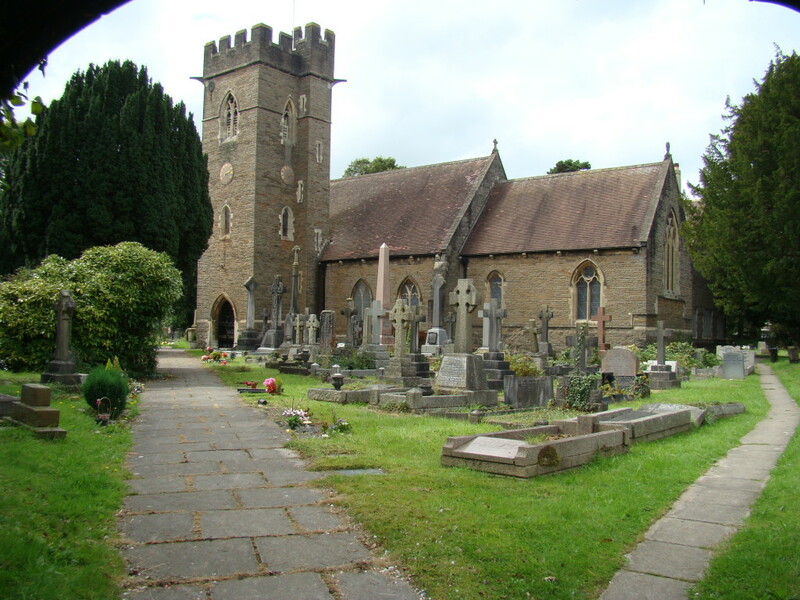 Above: St Mary, Whitchurch. 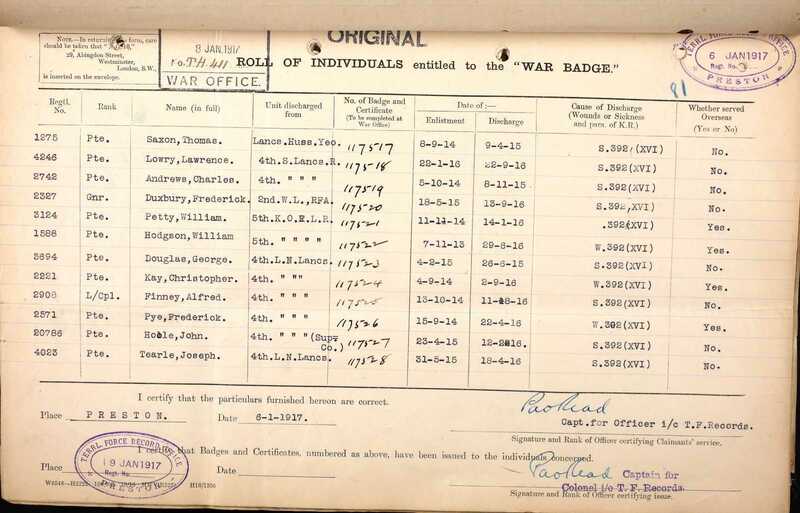 On 19 Apr 1916, James transferred to the 24th Protection Coy of the Royal Defence Corps. He was living at 3 Hazelhurst Rd, Llandaff North, West Cardiff.He was described as a Shopkeeper, 5ft 7in tall, blue eyes, fair hair. In a medical report dated 22 Mar 1917, he was said to have been on leave in Preston from Fairweather Hospital, Cardiff when he contracted diarrhoea. He was operated on in Worley Hospital on 26 Feb 1916. He was certified “No longer physically fit for War Service” on 16 Apr 1917, and died on the very same day one year later. He was just 56 years old. 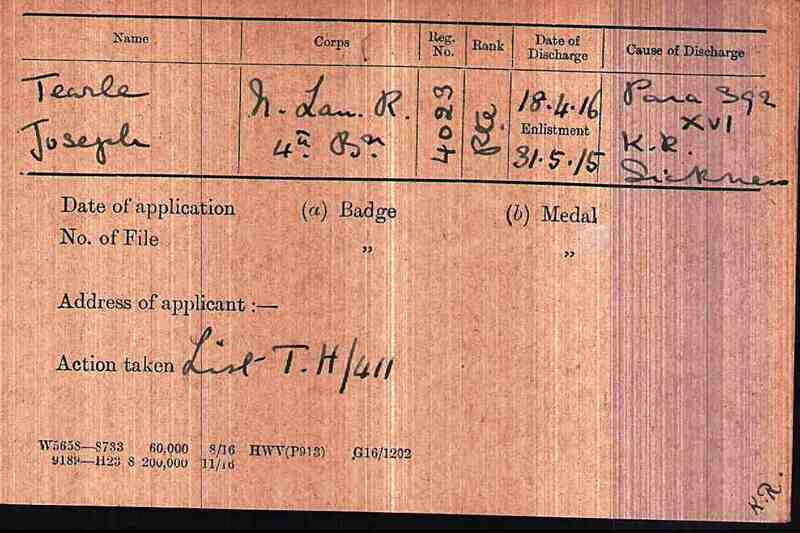 Here is a copy of the record the army used to ensure he was correctly awarded the Silver War Badge. 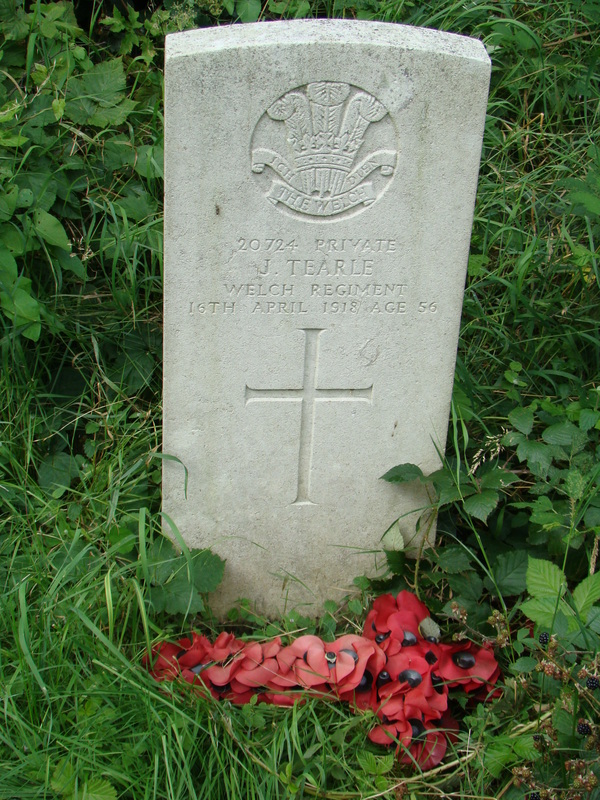 James Tearle 1862 Preston CWGC headstone in St Mary Whitchurch, Cardiff. On 17 Apr 1918, his widow was awarded a pension of 15/- a week. The fact that James was in Preston when he fell ill means to me that he still kept in touch with his family. The trip to Preston from Cardiff is a major undertaking and indicates the depth of the relationship he still enjoyed with his far-off family. I wonder sometimes if James knew Charles 1894 Preston, above? It’s possible that in being an orphan he didn’t, but they are closely related, and in the same Lancashire regiment. James did receive a medal, but the record is unclear as to which one. I have no clue as to why James should move all the way from Colne, Lancs to Cardiff, but his wife’s name might be Welsh and perhaps she felt the need to go to her family. As with all the Preston Tearles, he is on the branch Joseph 1737. 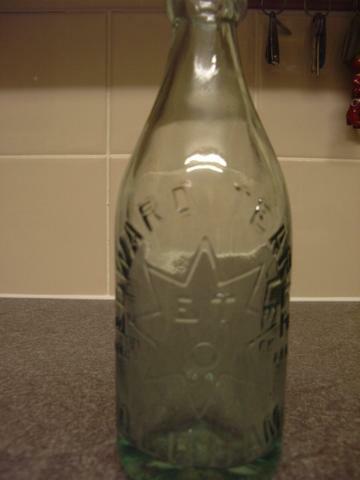 “Two or three years ago, I saw an old ginger beer stoneware bottle advertised on e-bay, which indicated that it ‘belonged’ to Edward Tearle of Oldham. I had never heard of him (we had not got the information about the Preston Tearles from CemSearch at that time). Nor was I entirely sure if ET was the maker of the bottle or the provider of the contents! Some token investigations revealed nothing and the matter became a ‘pot boiler’. Other – glass – bottles came up on offer, but still research fell on stony ground. Finally, about two months ago (Sept 07) one came up that I could afford but I was outbid. Every time one came up for auction, I would mail the seller and ask if they had any information about Edward – none of them knew anything. Many bottle experts and collectors were mailed, but I still no progress. Out of the blue, a seller of a previous example offered to send me, free gratis, another bottle he had. I accepted gratefully and it duly arrived. At last I could see exactly what was on the bottle. The seller had dated the ir as 18th century, but this was clearly incorrect: the figures 1707 appeared on the base of the bottle and it would be easy to assume that this constituted a date. As it turned out, it was a maker’s mark. The maker’s name was ‘N & Co’ which I was able to establish as Nuttall & Co of St Helens. They were active in the mid 19th century until 1913 or so when they were absorbed by the United Glass Co. 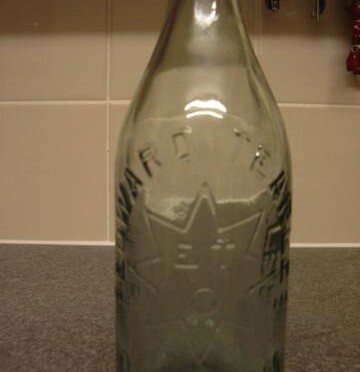 The markings on the bottle were decisive: ‘Edward Tearle’ and ‘Oldham’ were prominent as was the trade mark – an 8 pointed star with ‘E.T’ and an embossed circle inside. Either side of the star were the words Trade and Mark – this helped establish that 1707 wasn’t a date as trade marks were not noted until the mid 19th century. There was some speculation in the group as to whether this might have been, in fact, Ebenezer Tearle, who was a known brewer in the London area, and whether the trade mark had any connection with Thomas Tearle’s Star Brewery, also in London. But a second bottle turned up in quick succession which was exactly the same except for the bottle makers – CS & Co – who were also based in St Helens. We knew we needed local knowledge, but with none available, we could not conduct the enquiry any further. is the man who brewed herb beer in Oldham, but whose later occupation was as a draper. I have tracked his partner, Henry Tinsley in the Electoral Rolls and he was listed at 9 Firth Street in 1894 and his previous address was 15 Cromwell Street where he was living at the time of the 1891 census. Cromwell Street is very near to Rink Road. Henry’s occupation then was given as a carter. See attached census extract. “I have been to Preston reference library today to find out where Sophia and Joseph’s grocers shop was. It seems they had two. One at 34 Maitland Street and one at 139 Ribbleton Lane. It looks like a lot of the Tearles owned businesses in Preston. The Gazettes of 1892 and 1893 contain details of Joseph Tearle of Preston and Oldham going bankrupt. Joseph Tearle, of 100, Wilbraham Street, Preston, trading at 139, Ribbleton-lane, Preston, also at Rimes-road, Union-street, Oldham as a Provision Dealer [at the first address] and as a Herb Beer Manufacturer [at the second address]. The words in brackets are my additions based on the layout of the page in the Gazette. The Official Receiver at Preston dealt with this and Joseph managed to repay 1s 11d halfpenny in the pound of his debts. We had uncovered the story of Edward, the herb beer maker of Oldham and seen into the life of Joseph and Sophia nee Kibble. We had been witnesses to a drama of the past and filled in some of the details we could only guess at from the 10-yr apart snapshots of the censuses. Edward died in 1903 and a colourful chapter of Tearle history in Preston closed. This memorial is, of course, in France, but Charles 1894, Preston, was the son of Charles 1858 Preston and Jane nee Fletcher. He died, along with more than 7000 British and Commonwealth forces, in the Battle of Cambrai, Nov and Dec 1917. Through his grandmother Sarah Tearle 1832 of Leighton Buzzard, he traces his ancestry to Joseph 1803 of Tebworth and Mary Ann nee Smith, and through them to Richard 1778 and Mary nee Pestel, which puts Charles on the branch of Joseph 1737. Joseph 1803 made the trek to the North when his own son, Joseph 1838 of Leighton Buzzard married Sophia Kibble. Her mother, Elizabeth, took them up to Preston, probably for a better life but also so she could be with her own family. Death cert 1889 Trinity (Preston) Lancaster 14 April 1889, 90yrs, Old age. Informant, Joseph Tearle, son, at 279 Newhall Lane Preston. Using this certificate as a starting point, I developed a theory on the origins of the Preston Tearles. Let’s start near the end and work both ways. According to the CEMSEARCH records “Report for Tearle in the Preston Cemetery,” Joseph Tearle died in Preston 1902 aged 64. There he is in the 1901 census at 34 Maitland St, Preston, living above a grocers shop, aged 61 with Sophia (63) and daughters Elizabeth 28 and Mary A 17. He records his place of birth as Beds Leighton Buzzard. Now here’s the first part of the theory. Mary Ann nee Smith is wife to a Joseph and mother to a Joseph as well. Perhaps the name of this last girl is a hint that Mary Ann nee Smith is the mother of this Joseph. Also you may notice that the numbers don’t tally. In 1901 he is 61, but in 1902 he is 64. In the same records there is the death in 1889 of Joseph Tearle, 90, father of Joseph, above. Since he is the father of Joseph Jnr, and we think Joseph’s mother was Mary Ann nee Smith, then Joseph Snr must be husband to Mary Ann. We also notice in the cemetery record the death in 1895 of Elizabeth Kibble, 83, mother of Sophie. In the 1881 census I found Elizabeth Kibble, mother of Edwin Kibble and his family, with young Charles Edward Tearle (Preston) 21, nephew. 1881 = Charles Edward 1860 neph w Elizabeth Kibble 69 in Preston. So the Kibbles and the Tearles kept close links. Also in the 1881 census in Preston is Joseph 1798 (ie Joseph Snr) born Beds Tebworth (transcribed Searle, but our man, all right) in the household as father-in-law of William Smellie, so Phoebe 36 (1845, from LB) William’s wife, is Joseph Snr’s daughter and Joseph Jnr’s sister. 1881 = Joseph 1805 Teb with dau Phoebe Smellie 36 in Preston. There were just over 2000 Josephs in Preston in 1881, but only three of them were of interest to us. In 1881, Joseph Jnr (1839 LB) and Sophia were living in Fishwick, Preston, with six children. 1881 = Joseph 1839 LB n Sophia 44 Geoffry 17 John Thomas 15 Edward 12 Elizabeth 9 Alfred 6 Joseph 3 in Preston. We now know that Joseph Snr’s family must consist of Mary Ann nee Smith, Joseph and Phoebe, who must be younger than Joseph Jnr. Since Joseph and Sophia are an unusual name for a couple, we’ll keep our eye on them as we work backwards. In the 1871 census, George 1825 and Maria are in Holbeck, Leeds, while there is a Jabez 1853 Stbg in Shipley, Yorks, labourer for an engineer – this is Joseph 1798 of Stanbridge and Maria nee Millings’ boy. Is it looking for work that’s driving them North? Also in the 1871 census we can see Joseph 1803 Teb living with Phoebe Smellie. This is Joseph Snr and his daughter. 1871 = Phoebe 1845 LB wife William Smelley 26 Mary A 2 Joseph 4m Joseph Tearle 1803 Teb in Preston. In the 1861 census there are some nice little tie-ups: Joseph (1850) in Leighton Buzzard (LB) and Sophia 23 have little Charles 1 at their knee (born in Preston) and are living in Preston with Elizabeth Kibble as head of the house and Edwin her son 10yrs. This is definitely Joseph Jnr from above, but you do have to wonder how his age can swing so far in just 20yrs. 1861 = Joseph 1840 LB Sophia 23 Charles 1 in Preston. In the 1851 census in Lammas Close, Leighton Buzzard, there is a Joseph 1803, widower, of Tebworth, father, living with George 24, LB, Maria 21 and Julia 6m. More tellingly, also there on that night was Phoebe 6 LB, sister (of George) and Charles 2 LB, brother – of George. 1851 = George 1824 LB Maria 24 Julia 6m Joseph 1803 Teb wdr father Phoebe 6 LB sis Charles 2 LB bro in Lammas Close LB. A short distance away in Vandyke Rd, Leighton Buzzard (look up Multimap) living as brothers-in-law to John Sharpe are Thomas 1837 and Joseph 1839. This means Ann Sharp was Ann Tearle 1823 LB. This is the daughter of Joseph and Mary Ann. 1851 = Thomas 1837 LB Joseph 1839 LB in house as brother-in-law to John Sharpe and Ann 1823 LB in Vandyke Rd, LB. So we now know that Joseph Snr’s family consisted (at least) of Ann 1823, George 1827, Thomas 1837 Joseph 1839, Phoebe 1845 and Charles 1849. There are other christenings for Joseph and Mary Ann nee Smith, but since they haven’t shown up in this story it is not necessary to list them. Also, don’t take too much notice of the ages; in 1841, Ann and George were both 15. 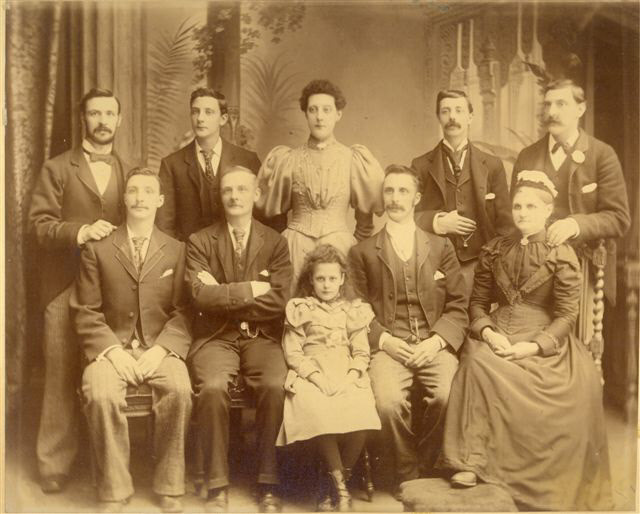 This list is independent of the Leighton Buzzard christenings and has been compiled by working backwards; This family is without doubt that of Joseph and Mary Ann nee Smith. I have Joseph T and Mary Smith married in LB 3 Jan 1825 witnessed by William Clarke. In 1833 (LB) they baptize James. In 1836 (LB) they baptize Thomas. But they did not stay for Joseph. 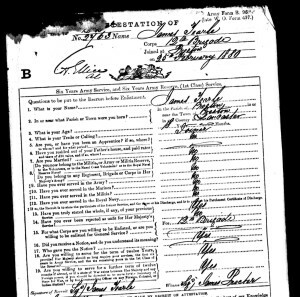 HOWEVER, I have the birth certificate of Joseph Tearle born 7 Sep 1838, LB, son of Joseph Tearle and Mary Ann nee Smith. When telling the story of the Joseph Tearles you have to be careful that you don’t mix up Joseph and Mary’s Joseph (1838 LB) with Joseph and Maria’s Joseph, 1836 Stbg. George and Elizabeth of Tebworth also have a Joseph born 1829, Tebworth, and we distinguish this Joseph because his father is not Joseph and he was not born in LB. The Preston Tearles are definitely Tearle Country Tearles; they are the descendants of Joseph Tearle of Tebworth, born about the turn of the 19th Century. He certainly was not born 1798 nor was he 90 when he died. If we take his age in the 1841 census, that makes him born as late as 1806. I am quite confident that the tree is correct; Joseph 1798 was from Stanbridge and married Maria Millings. So now we need to search the Tebworth/Chalgrave records to find Joseph 1860-ish. 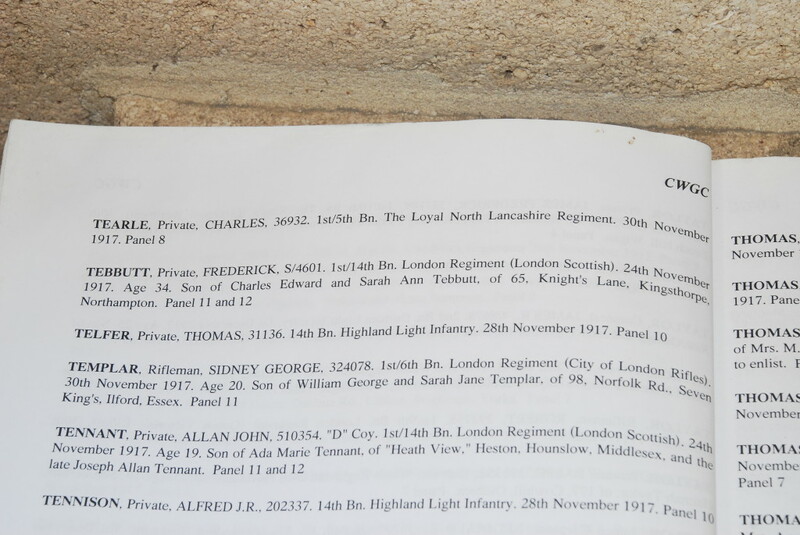 There’s a nice big gap there between Phoebe 1803 and William 1814, children of Richard and Mary nee Pestell…. and a large number of the descendents of Joseph 1737 and Phoebe nee Capp called a daughter Phoebe.The original Joseph was Joseph 1803 (he changes his age with each census, but this is him) one of the unbaptised children of Richard 1778 of Stanbridge and Mary nee Pestel. Joseph 1803 and Mary Ann had, amongst others Sarah 1832, and Ann 1826 who married John Sharpe and hosted Thomas 1836 and Joseph 1838 for a while in LB, at least in 1851. Joseph 1838 married Sophia Kibble and they are housed by Sophie’s mother Elizabeth Kibble, who takes them up to Preston, where many of her family live. Joseph’s father and Phoebe his sister follow them. While she is in Preston, Phoebe meets and marries William Smellie of Preston. Sarah 1832 has a boy Charles and then goes up to Preston and marries Thomas Hoole from Manchester. She has two children by him and dies in Preston, aged 53. Young Charles marries Jane Fletcher and has, amongst others, Pvt Charles Tearle who is killed in France in 1917. Those are pretty bare bones, but that’s it. All the Preston Tearles in the CemSearch report of the Preston Cemetery are the family of Joseph 1803-Ish, born in Tebworth. The Tearle Family group was taken at 69 Calverley Steet,Preston approximately 1898 and is as follows: Back Row: (Left to right) Edwin, Joseph, Elizabeth, Thomas and George (Edwin is either Edwin Kibble or Edward Tearle, and I have no record of a George) Front Row: Alfred, Joseph (father) Mary Ann (age 14) Charles and Sophia (mother) This photo was sent to me by Hazel of Preston, for which I am deeply grateful. 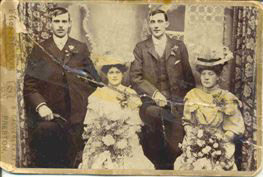 The wedding photograph is of Mary Ann Tearle (the youngest daughter daughter in the photo above) to Henry Gillgrass Parker (couple on the left). The first is the family of Joseph 1838 LB and Sophia nee Kibble. You can see listed here Joseph 1803 Tebworth, his father. In affectionate remembrance of Elizabeth daughter of Joseph and Sophia Tearle who died January 5th 1865 aged 4 years. Also Sophia their daughter who died March 11th 1877 aged 10 months. also Joseph Tearle grandfather of the above children who died April 14th 1889 aged 90 years also Elizabeth Kibble mother of above Sophia Tearle who died Jan 2nd 1895 aged 83 years also Emily May daughter of Edward and Emily Tearle (grand-daughter) who died Dec 19th 1899 aged 1 year and 7 months also above named Joseph Tearle who died October 18th 1902 aged 64 years. also Elizabeth Tearle daughter of above who died October 25th 1906 aged 35 years. Also Rachel Tearle daughter of Joseph and Rachel Tearle(grand daughter) who died March 7th 1908 aged 11 months. also Sophia wife of above named Joseph who died January 20th 1922 aged 84 years. This is Charles Edward 1860 Preston, eldest son of Joseph 1838 and Sophia, above. Joseph son of Charles and Jane Tearle who died May 13th 1893 aged 4 months also Arthur their son who died August 9th 1900 aged 1 month also PTE Charles Tearle 1/5th L.N.L Regt. son of above killed in action November 30th 1917 aged 23 years. Also Jane,wife of above Charles and mother of the above children who died October 9th 1921 age 62 also Charles, husband of Jane and father to above children who died 26th June 1922 age 64. Also Mary Fletcher mother of the above Jane Tearle who died Dec 11th 1898 age 74. Also Sarah Hoole, mother of the above Charles Tearle who died November 14th 1884 age 53. Also Ellen sister of ????? (I could not read any further as the stone was covered with soil. This is Charles 1858 Preston, son of Sarah 1832 LB, who was an elder sister of Joseph 1838 above. His wife was Jane Swarbrick. One of their sons, Charles 1894 Preston, as you can see from the inscription, was killed in WW1. Charles was killed during the Battle of Cambrai, which started on 20 Nov 1917. When the Germans regrouped and attacked on 29 Nov, after initial Allied success, Charles was killed in the following 5 days of fierce action. 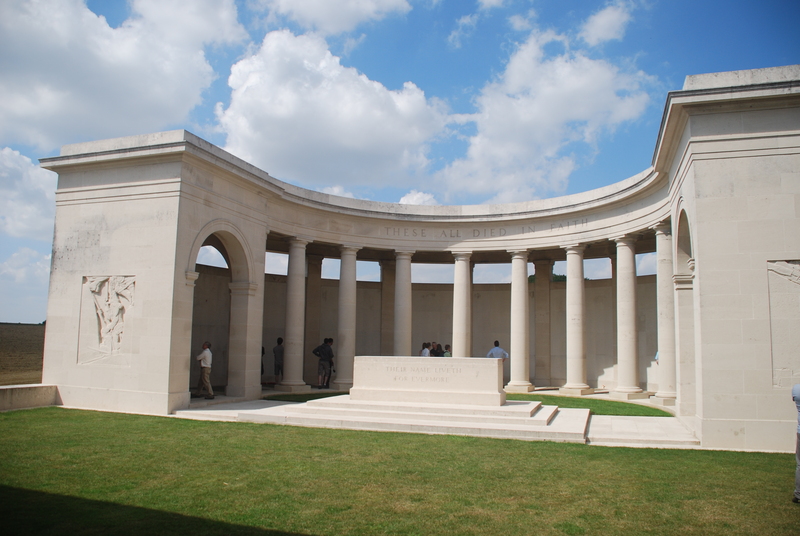 Cambrai Memorial was established to commemorate those who have no grave. 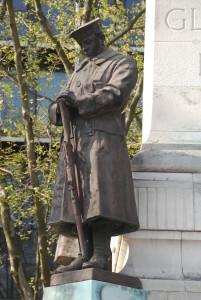 A railway porter, he is remembered by the LNWR memorial in Euston Rd, although there are no names on it. Around the base of the monument there are four over-sized bronzes of military men; a sailor, an infantryman, an airman and a gunner. Bronze figure Euston Station War Memorial. I understood that there was a list of about 3500 names of railway employees killed in WW1 associated with this memorial, and I spent a day around the station trying to find it. Eventually, I discovered that the names had been collated and printed in a book, a copy of which was given to the family of every casualty. It would be interesting to know who of Charles’ family the book was given to, and whether it still exists. I would love to see it. 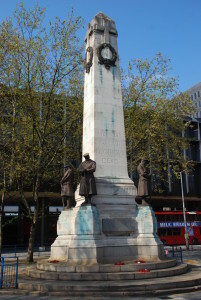 Suffice it to say, that the Euston memorial will have to speak for Charles, and now that we know at least some of his story, and the history of his family, we can be assured that we will not forget him, and that we will always remember the sacrifice he made for his country and his family. See the story of James 1862, the soldier, who is buried in Cardiff. Charles was killed during the Battle of Cambrai, which started on 20 Nov 1917. When the Germans regrouped and attacked on 29 Nov, after initial Allied success, Charles was killed in the following 5 days of fierce action. Cambrai Memorial was established to commemorate those who have no grave. Son of Charles 1860 of Preston and Jane nee Swarbrick. His mother was Sarah Tearle 1831 who had made her way up to Preston following her father and brother, hoping for a better life. She married Thomas Hoole in Preston in 1868. Sarah’s parents were Joseph 1803 of Tebworth and Mary Ann nee Smith, who died in 1849. Joseph’s parents were Richard Tearle 1778 of Stanbridge and Mary nee Pestel. And Richard’s parents were Joseph Tearle 1737 and Phoebe nee Capp. There is a lot more written about the story of the Preston Tearles here, some of it occasioned by the discovery of the story of Charles Tearle, soldier. Pte Charles Tearle 1st/5th Bn The Loyal North Lancaster Regiment. The army record of gratuities to his family (below) show two sums sent to his father, Charles, in Preston. Here is the Cambrai Memorial in the grounds of the Louverval Military Cemetery. 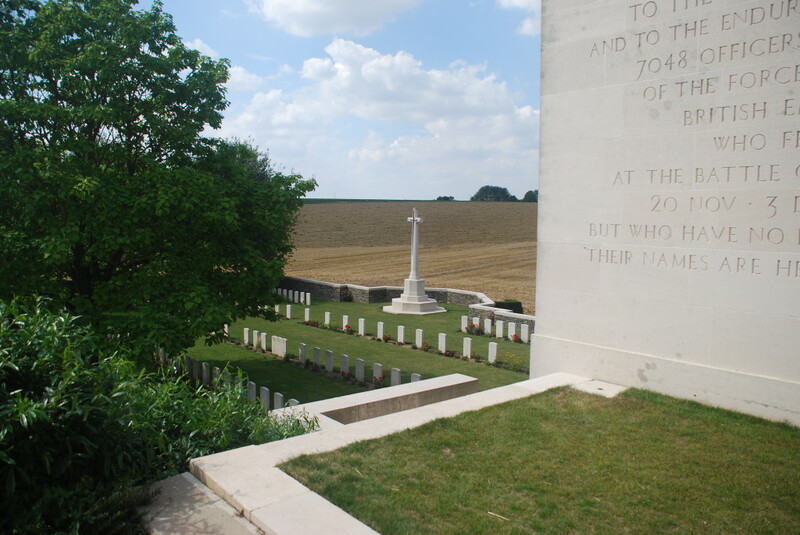 The headstones in Louverval Military Cemetery mark the graves of fallen soldiers; however for those whose bodies were never found, the names are inscribed on the Cambrai Memorial. 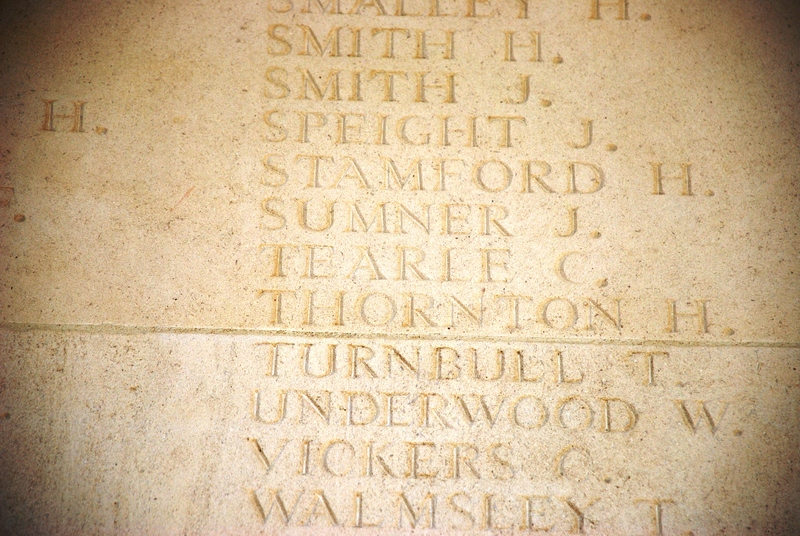 Here is Charles’ name on the Cambrai Memorial.